Frostbite is one of the effects of global warming, so it only appears in longer games or games involving industry. Climate change would be a more accurate term, I suppose, but global warming just has a nice ring to it. Well, the globe is warming as a whole, so it's a reasonable term - just always interesting (and apparently for some people, confusing) that global warming doesn't necessarily mean immediate local warming. You can now drag around orders within your order list, and we've also added a little gizmo that shows which player has initiative each round. No gameplay changes because we mostly want to focus on growing our playerbase, which isn't going as fast as we would like. On top of that we're also trying to found a cooperative, which comes with its own set of fiscal topics we need to delve into and crazy notary costs. We were working on a gameplay change, but it ended up not making the cut; we noticed that a lot of FFA matches tended to drag out a lot because at some point all players have highly upgraded industry or barracks tiles and just keep sending wave after wave of tanks and gunners without achieving anything. We think this is because money stops being a factor after a while, so it is harder to gain an advantage over your opponent; capturing or destroying a Town does nothing since they have enough money, and killing their units is not effective if they can afford to rebuild them. So we came up with Morale as a second resource next to money, that was collected by exploring the map. We had hoped that in the late game, when all players have a seemingly unlimited amount of money, it would force players to explore unexplored areas of the map and thereby creating a new focal point. In practice though our current maps are laid out in such a way that you explore almost all of them as you are attacking your opponent, so you just end up generating an endless supply of Morale in the early game and it would only factor in as a "clock" that ultimately limits the amount of units you can make. So we scrapped it for now, and just made the FFA maps smaller, which seems to help a little. Maybe we should just rebalance unit costs a little bit so you are decentivized to hoard up a ton of money. You could add a decay factor on wealth generation methods like industry, so they decrease their output over time as resources run out? Well we feel reasonably confidant that we can come up with solid constitutions, but the notary charges more for a homewritten constitution than they do for changing a boilerplate one. So we have to scrap the stuff we wrote and figure out which parts of it are worth getting charged for. Same thing with the tax authority, every time we think we've figured out how the Dutch tax law works we realize we also have to figure out how they think the tax law works. Yeah, that would probably be the best solution, and for income from farming this already applies. Cities and towns however grow during the match so they only become more valuable, and if you upgrade Industry it also generates more income. One thing we are considering is having cities and towns lose power at night if their surroundings become too ugly, and similarly have industry lose power if the surrounding cities cannot sustain them. But it might feel a bit punishing if you suddenly lose power in the middle of the game without spending it. Aie, yeah... it sounds like you've got a more bureaucratic system than the UK too, then, as regards setting stuff up. And yes, I think I need to play the game a bit more to try any more detailed suggestions. I'm just struggling for time as usual. Yesterday we released version 0.23.0 with some big gameplay changes, including a new unit: the Militia. The Militia replaces the Rifleman as the starting unit and has basically the same stats, except it only has 1 hitpoint. 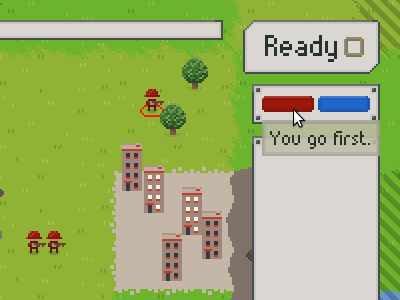 The Rifleman is now built at the Barracks and remains the only unit that can capture enemy tiles, so we changed the win condition to include occupying all enemy City tiles simultaneously. This was mostly done because mass producing Rifleman units seemed to be the strongest strategy and once a player captured one City from an opponent, they had a massive advantage; not only does the opponent lose the income and production of that City, but the capturing player gains extra income and production as well. The hope is that Militia units occupying your City tiles are easier to get rid of due to their lower hitpoints and the fact that once the Militia is gone, you immediately regain control of your City tile. 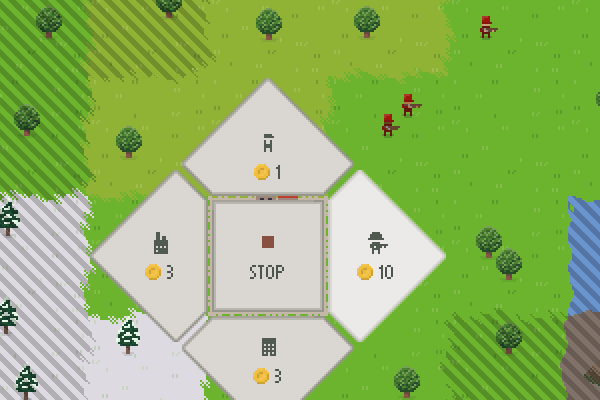 We also made it possible to produce units in tiles that you are defending with a friendly unit by having the produced unit spawn next to the defender and move to an adjacent tile. After we reworked the AIs to be able to handle these gameplay changes, the RampantRhino AI seemed to be lot better at defending because it no longer avoided placing its units on its own tiles. The last big gameplay change is that Tank units can no longer attack and must rely on their Shell ability to wreak havoc. This was mostly done because it was harded to defend against them using only Militia, but it also fits the fantasy of cumbersome but unyielding tanks that must take their time to aim. 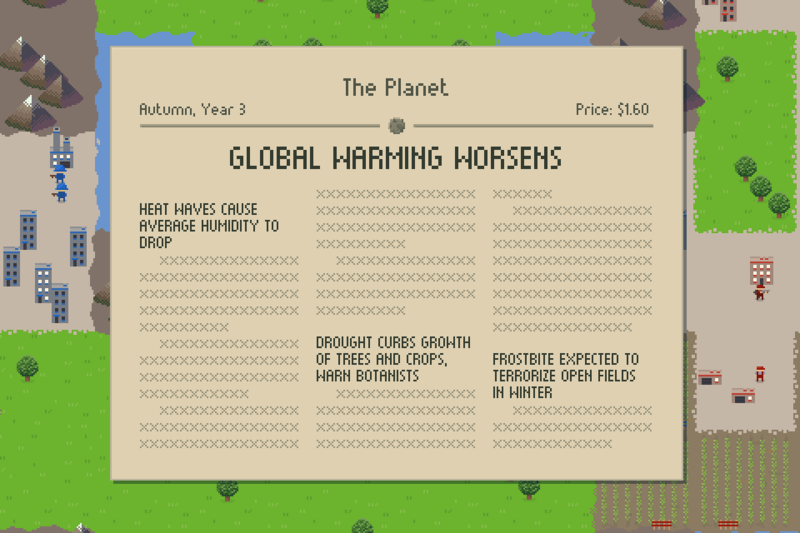 Lastly we reworked the UI and added a newspaper as a little announcement every time global warming crosses another threshold and new disastrous weather effects are unlocked. We're running a little round robin tournament over on our Discord server which is going well; round 2 is starting this week with the new gameplay changes, so I'm curious to see how these gameplay changes alter everyones' strategies. Ooh, the newspaper style thing is fun The game has an interestingly C20th feel considering global warming is quite a C21st phenomenon. Yeah, we're blending a lot of time periods together; the trenches and zeppelins are reminiscent of WW1, the tanks are more WW2 and we also have nuclear bombs planned. There was no deliberate message behind it when we started it, but it does feel appropriate that the game applies just as much to the world in 1918 as to the world in 2018. After a lot of research into the Dutch laws on cooperatives and their constitutions, Daan and I are now A Bunch of Hacks! This did mean that we couldn't spend a lot of time on actual gamedev, so it had been a while since our last release. In today's release, version 0.25.0, we've integrated Stomt into our game, so you can give feedback or upload log files directly from within the game. We've also added some dust particles and other particles to add a little bit more juice to animations. The big new feature is weekly challenges. We wanted to give players a bit more reason to rejoin even when no one else is online, and we thought challenges would be a nice way to add some variation to the gameplay without having to worry too much about balance. We're thinking of making challenges with crazy rulesets, such as all units have double speed, or the player has unlimited money, etcetera. For now, the first challenge just uses the normal rules, but the enemy starts with a lot more units than you. 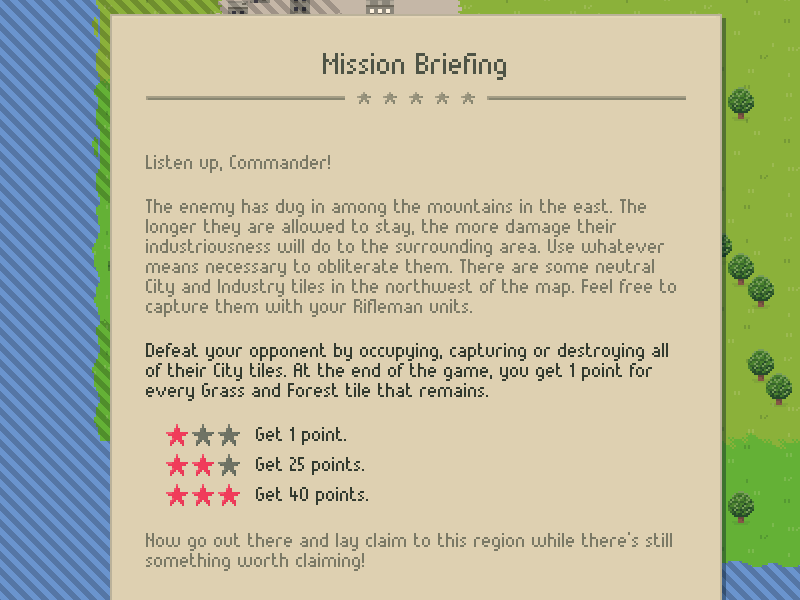 The rules are explained in a little mission briefing, which is supposed to be written by the General, the main advisor in the singleplayer campaign that we're planning to add in the future. At the end of each challenge you are awarded with stars, and you can accumulate stars by completing a new challenge each week. Getting the third star is intended to be quite difficult; I don't think Daan has beat it yet. Missions sound really neat as well - definitely a good addition. The two of us are running dangerously low on funds, so we've had to divide our time between developing, setting up a crowdfunding campaign and panicking. We did release version 0.28.2 yesterday, so that's something. Other than implementing a self-patching patcher, I've been spending a lot of time on improving the UI in various ways. I made some monochrome icons for each type of unit, building and order, and these icons are now used consistently between the order panels (shown above) and the order guides and order list (shown below). We also added some hitstop to attack impacts, both to give them more oomph and to make the attack animations more readable. We hope that the more prominent hitmarkers help players to follow along with the way that damage is distributed. We noticed that players are having a hard time finding each other in our in-game lobby system, so therefore we've been focussing a lot of our attention on improving our Discord server, and making it the center of our playerbase. 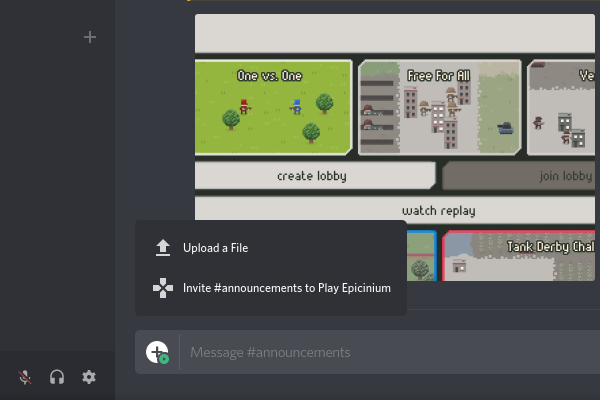 One thing we've done is integrating Discord Rich Presence, which means the game shows up next to Discord users' names while they are playing, even showcasing the map, game mode and match duration. It also allows users to post invite links in the chat. Starting next week we also want to have automated mini-tournaments every week: Discord users can join the tournament at any time, play a game against another participant on any map and the winner is awarded tournament points. The winner gets three stars (the same that you get for completing challenges), and the other participants do as well based on their total score that week. We're hoping that the free-form nature of those tournaments will stimulate more of our players to play games against each other.